Yesterday I threw a Pie Party. This is my favorite kind of party to throw, which I discovered my junior year of college, when I threw my FIRST party (pictured). It's a good kind of party because 1) Pie is the best food there is. Pie joins together delicious crusty bread-part with fruit or chocolate or kale or vegetables or WHATEVER, and they get married in your MOUTH. And 2) If everyone brings a pie, I can easily actualize my life dream of having one pie where every slice is a different kind of filling. Then you can EAT THAT PIE. I kind of want to write something here about how a group of people is a little bit like a pie with many different flavors, but I think that might be a stretch. I wanted to throw a party because I have had a very depressing five months or so, and I hoped to recommit myself to celebration. Also, I've been really flaky (pun intended) to everyone I love lately, and I needed to remedy that in one fell swoop. For the first two hours of this party, I have to tell you, I really suffered. Never wear crinoline and lace to a wedding. I had scheduled the party to begin at 4:30, because I am an idiot. I actually don't know what I was thinking when I set that time. It was Friday, so no one was even off work by 4:30. So at 4:30 I was sitting alone in my kitchen wearing a party dress. (It's hard to decide whether or not to wear a party dress to a casual party. I have a lot of party dresses, because that's the kind of thing I impulsively buy. I see them on the clearance rack and think, "Yeah, I'm going to look like a Vogue Magazine photo spread when I put that on." And then the opportunity to actually wear the party dress never comes, because in fact, I lead an ordinary life which generally includes very few parties. And since I live in New Orleans, the parties I do get invited to have themes like, "Everyone Dress Like Your Favorite Cookie," or "Erase Social Injustice Inequality And Hatred Fundraiser Celebration." 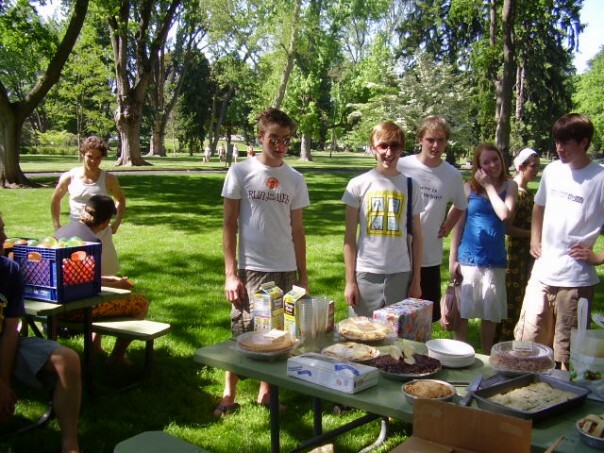 So anyway, I knew no one was going to be in a party dress at this pie party, since initially it was supposed to be an outdoor picnic anyway, with a last-minute location change due to rain. I didn't want to look like the kind of person who needs to be complimented on her outfit all night long. I mean, I was already forcing these people to come over and eat my favorite food with strangers. It seemed cruel to also ask them to tell me I looked like a princess. Which is basically what you are asking people to do when you wear a party dress. But I decided to just go for it, because that damn crinoline and lace number has been hanging in my closet for three years with nary a baby shower brunch or afternoon wedding to appear at. Actually, on second thought, never wear crinoline and lace to a wedding; people will congratulate you.) I'd made an impressive pie, but it was meant to be refrigerated or it kind of started to melt, so I kept ferrying it between the fridge and the table. The table looked very sad without the pie on it. Actually, the table looked a little sad with just the one pie on it, too. I spent, like, fifteen minutes just taking timed pictures of myself in my kitchen, because I didn't really know what else to do, and I am a narcissist (pictured). Then, three people arrived. One was Bryan, who is a handsome realtor I do improv with. One was Willa, who might be the love of my life, and is a writer I wish to have non-sexual sleepovers with. The last was my roommate Hannah, who had actually been there all along, but was having a phone conference in her bedroom while I was taking pictures of myself in the kitchen. They are all lovely people -- some of the loveliest I've ever known. I was immediately worried they would hate each other and decide never to hang out with me ever again to punish me for putting them in an uncomfortable environment. In situations like these, I generally start asking everyone in the room to say their favorite Disney princesses. It's like I don't believe other human beings have learned yet how to have conversations with each other without a set of Loaded Questions cards sitting on the table to guide them. Then more people came, and I freaked out more, and I could not for the life of me understand why I thought that throwing a party was possibly a good idea of a thing to do. At this point, I should divulge that I am an introvert. That's surprising to people because I'm obnoxiously loud, and I get in public places all the time and say things like, "EVERYONE SAY THEIR FAVORITE DISNEY PRINCESS!" I will do this with a microphone if a microphone is given to me. I always volunteer to read during presentations where a volunteer reader is needed. This may be because I'm a narcissist and love to hear my own voice (see above). But actually, here are some likes and dislikes of mine. Likes: drawing alone, painting alone, writing alone, drinking juice alone, watching Adventure Time in my bed with my cat, taking a bath, hiding in a corner with a book. Dislikes: parties with alcohol, parties with a DJ, parties with a costume-related theme, parties with a social justice-related theme, weddings, baby showers, high school graduations, casual hang outs with groups of pals, going to the bar after the show. In short: I like to be alone. I dislike being with other human beings. So here I was in the midst of this pie party, and I was panicking. Everyone else was doing fine, mind you. There was a sweet potato pie, an apple pie, my melting pie, lots of wine and beer, pizzas (people are so clever! ), and a sort of flaky galette that honestly I would have married if people were legally allowed to marry a food. (Let's get on that, by the way. There is potential for me to be very happy.) People were talking and laughing and getting along because I have very charismatic and interesting friends who learned how to have conversations when they were babies. Collaborative art project for party-going introverts. I had set up a collaborative art project in the living room in case people didn't know what to do at the party. No one was doing the project because everyone was having organically-derived fun. THIS PARTY WAS A HUGE FAILURE. I sat alone in the living room wishing I had not thrown a pie party. I was sure had lost all my friends and now no one would find my body when I died. Then the pies got eaten (as they always do), and I was told I looked like a princess at least thirty times, and a child came and make the collaborative art project look amazing, and then, before I knew it, everyone left. Hannah stayed in the kitchen washing dishes. I was very bouncy. "Wasn't that great?" I said. "It was so fun!" Hannah said. It had been so fun. It's just that the idea that I am responsible for everyone in a space having so much fun is the scariest idea to me. The thing is, that's a silly fear, because everyone in the world is responsible for his or her own fun-having. It is not up to me to ensure that the people I love enjoy themselves and find something to ignite them when they choose to spend a few hours of their Friday night in my living room. For heaven's sake, I should have learned by now that when you call something a "pie party" it is going to be a great success, no matter what. Maybe one day I'll figure out how to feel that way at 4:30. Until then, I feel like I have earned at least a week where I get to hide under my covers with old issues of The New Yorker and my phone in Airplane mode.